Produced by Cheryl Brumley. Music and sound came courtesy of the following users at freesound.org: transitking (telephone ring); benboncan (telephone ring UK 2); keybit2 (ring-ring) and regenpak (alcohol survey); and the following user from the FreeMusicArchive.org: Podington Bear (By Grace and Light in Branches).Podcast logo: headphones: gcg2009 (Sennheiser) via Flickr. The Impact of Social Sciences blog introduces its podcast series Audible Impact, which highlights a range of perspectives on academic research. Digital Editor, Cheryl Brumley, discusses her narrative approach to the podcast series. 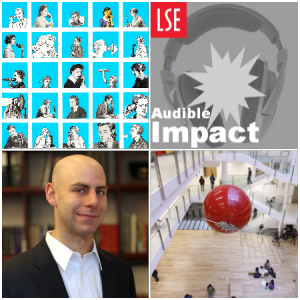 Audible Impact launches today, the latest audio offering from the LSE Public Policy Group (PPG) blogs. We wanted to do something different with this series of podcasts, something that might inform the way we at the LSE PPG tell the story of academic research in the future. So for our first episode, we met with Adam Grant, Professor of Organisational Psychology at Wharton Business School. His latest book Give and Take: A revolutionary approach to success, details his studies into pro-social behaviour in the workplace, and why being a ‘giver’ is the key to getting ahead (this is where the Gordon Gekko’s of the world stop reading). 2.) His book is rich in material, with narrative detail of his field experiments and anecdotes from the world of business. This latter characteristic especially had me thinking about how best to tell the story of Grant’s research findings and whether the key to this was hidden somewhere in his book. All academic research has a story to tell but academic necessities, both qualitative and quantitative, can sometimes disguise that narrative and effectively isolate the non-specialist. Grant’s research, however, already does attract an audience outside of his field niche, he regularly consults some of the world’s top companies and organisations like Google and the United Nations. It may therefore appear like much of our work had been cut out for us — Grant is the incarnation of public engagement. However, as we are launching a podcast for the LSE Impact blog, with a majority academic readership, it required that we take a different approach to the typical Adam Grant feature story; we had to somehow translate his appeal in the corporate world to the academic one. A podcast is only as good as its first few minutes so one doesn’t have very long before a listener decides that they’re time is better spent. One can hook an audience with a teaser (“On today’s podcast you’ll hear from this amazing person about this ground-breaking concept!”) or with a story. Since, we only had one guest we wanted to jump right in with the latter. If we could identify Grant’s primary research story, one that encapsulated his various strands of interest, we could use that to both intrigue the listener and also to prepare the podcast for the exploration of other themes. Adam’s call centre research seemed to fit this brief because it offers a complete narrative: Adam goes into a call centre, sees that the staff are miserable and unmotivated, and he introduces an experiment that completely turns things around. Although, this is only one field experiment in a whole body of work on pro-social motivation, it was a key experiment which could lead the way into his wider thinking. We opened with Grant’s call centre story and this easily led us into more specific discussions about his book’s main thesis and and his research methodology and how that relates to the impact of social sciences. What is also distinct about this podcast is that instead of merely volleying of interview questions and answers, Sierra Williams, LSE Impact editor and host of Audible Impact, interjects with her own narrative, setting up each sound clip with an editorial comment or segue. Although it takes more time to develop a script, this format gives the producer more control over the story. He or she can steer the podcast in the direction of our choosing rather than being bound by the sequence of interview questions. We hope this new format also makes for a stimulating listen! The conversation doesn’t stop with Adam Grant, either. Sierra and I are interested in hearing more from Impact readers about what they think of the format, Grant’s research methods, and whether or not the terms ‘giver’, ‘matcher’ or ‘taker’ apply to the academic workspace. Write to us in the comments section below or Tweet us @lseimpactblog. Cheryl Brumley is Digital Editor for the LSE Public Policy Group blogs and has created and produces the LSE Review of Books Podcast, voxEUROPP, British Politicast, and Audible Impact. Cheryl graduated from the LSE with an MSc in Theory and History of International Relations with a focus on political Islam. She previously conducted research into social media and the Arab Spring at the Regional Centre for Conflict Prevention in Jordan, and researched for BBC World Service radio and Public Radio International. You can find her ‘Simple Guide to Academic Podcasting’ blog posts here.